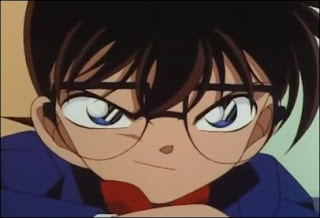 Recently, our guide in the land of the Japanese detective story, Ho-Ling Wong, posted an enticing review on this blog of an old episode from a long-running anime series based on the popular manga often raved about on this blog, Detective Conan, which has been running since 1996 – culminating in 26 seasons and 900 episodes at the time of this writing. Understandably, the source material proved insufficient to keep the anime running for over twenty years and original stories had to be produced. However, the TV originals are generally considered to be the poorer episodes and one of my reasons for sticking with Gosho Aoyama's original work. The other one is the frightful prospect of a backlog of hundreds, upon hundreds, of episodes! The Cursed Mask Laughs Coldly is episode 184 from season 7 and originally aired on March 13, 2000 as a one-hour special. According to Ho-Ling, this episode has not only been "lauded as one of the best anime original episodes ever," but is considered to be "one of the best episodes" period. So my curiosity got the better of me and decided to give the episode a shot. I can already reveal that the plot has a ghoulish gem of a locked room trick! An absolute work of art! Anyway, in order to stay consistent with my on-going review of the U.S. publications of Detective Conan, re-titled Case Closed, I'll be calling the characters by the names used in the English version. Yes, I know. Heresy and all that. You may vent your purist anger in the comments. The Cursed Mask Laughs Coldly begins with Richard Moore, Rachel and Conan driving to the imposing mansion of Beniko Suo, President of Mahogany Promotions, which is a charity organization for children who lost their parents in a car accident, but they nearly crash themselves into a tree trunk that had been placed on the road – a note had been pinned to the trunk. It told them to turn around or "you'll regret it." The warning was signed with The Phantom of the Cursed Mask. Not deterred by this threat, they arrive at the mansion and, upon entering, they're greeted by walls decorated with masks. There's even a mask room, or Chamber of Masks, which is the only room in the house connecting the east and west wings. One part of the collection in the mask room are two-hundred, identical-looking masks that were made by a Spanish artist, Julio González, who was consumed by his work and committed suicide when he had carved the last mask. All two-hundred masks were found around his body and the blood made it look as if "the masks themselves had sucked it out of him," which helped them acquire the reputation of being cursed objects. As a precaution, every night at the stroke of twelve, the mask room is locked from both the east and west side, because "the masks like to do pranks" and after midnight "they will start to walk" – terrifying everyone unlucky enough to encounter them. And against this backdrop the other participants of the upcoming charity event arrive. This group consists of a rock star, a well-known photographer, a popular baseball player and tarot prophet. The cast of characters is further rounded out by the assistant of the president and a pair of twin sisters who work at the mansion as maids. So the stage is properly set for some good, old-fashioned shenanigans. 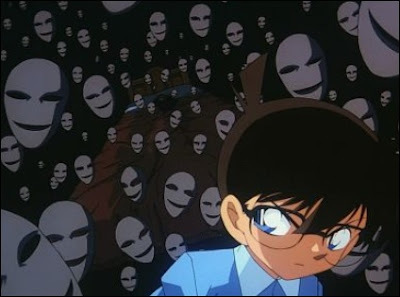 During the night, Conan gets a phone-call from inside the house and the caller is nobody less than the Phantom of the Cursed Masks. The Phantom tells Conan that "the Cursed Masks are high for blood," a sacrifice and to hurry, or they won't make it, but there's a lot of confusing and running around – because the locked doors of the mask room separates the house in the east and west wing. However, they eventually arrive at the bedroom door of Beniko, but the door is double-locked from the inside. One of these locks is a big, sturdy padlock. So the window above the door is shattered and Conan climbs through the opening to open the room from the inside. The bedroom is littered with the González masks and Beniko is on her bed, a knife-wound to the throat, but nobody else is found in the room! A second door in the room was sealed years ago with bolts and the windows were shut air-tight. You couldn't fit an arm through the narrow bars of the grill above the bolted door. So how did the murderer enter and leave this tightly-shut bedroom? I accidentally stumbled to the first step of the locked room trick, because the divided layout of the mansion and the bloodstained handle of the knife recalled Roger Scarlett's Murder Among the Angells (1932). You can say that these stories handle the knife in a somewhat similar way, but the comparisons end when the murderer of this story elaborates on this idea by creating a diabolic and nightmarish way to kill inside a locked room – an original idea complemented by the visual medium. You get to see the locked room trick unfold in front of your eyes and this ensures the explanation of this seemingly impossible murder is played-out to full effect, but the natural, down-to-earth solution does nothing to diminish the nightmarish quality of the murder's work. Some would probably argue that the trick is more terrifying than an unsolved murder with hints of the supernatural. Edgar Allan Poe would have approved. The murderer and motive were easier to spot, but you only need a passing familiarity with a certain trope of these mystery anime and manga series to be able to do that. Somehow, the writers of these series have a fondness for a particular plot-motif, which tend to make the murderer standout in a crowd of suspects. Yozaburo Kanari mastered that like no other. But the main attraction of The Cursed Mask Laughs Coldly is the ingenious, nicely clued impossible murder and the combination of originality, execution and presentation makes it a (minor) classic of the locked room genre. Highly recommend! I'll end this post with a thank you to Ho-Ling for bringing this delightfully macabre locked room mystery to my attention. Now we'll wait and see how long it will take me to get back to the Detective Conan movies! holy moly! just watched this episode after your review and i can firmly say that the solution is so well thought-out and ingenious. definitely one of the best in the anime, or ever, period. but i am curious to see if it can indeed "work" irl? also what happened to the second part of the(i inversed the word to not give away the tiny spoiler) "citsale"? anyways, i am so glad you reviewedd this locked room mystery. i needed a great solution after the dud that was "the fair murder" by nicholas brady. are you considering doing a best of list of anime locked room mysteries? or just detective conan? i have seen "Subete ga F ni Naru: The Perfect Insider" and it has a good locked room too and i am curious to see your reaction when you witness the solution. it was also adapted in a j-drama series which summarized the whole anime in one episode. you can find english subs online. "...also what happened to the second part of the(i inversed the word to not give away the tiny spoiler) "citsale"?" I'm not going to elaborate on that too much, because it would spoil the fun for others, but during the reconstruction only one of them was cut. And if you skip back a couple of minutes to the start of the reconstruction, you can see how the whole trick was tied together. So the answer is that it was definitely no longer in the room. "anyways, i am so glad you reviewedd this locked room mystery. i needed a great solution after the dud that was "the fair murder" by nicholas brady." You're selling The Fair Murder short. I warned in my review that the book should not be read purely as an impossible crime novel. 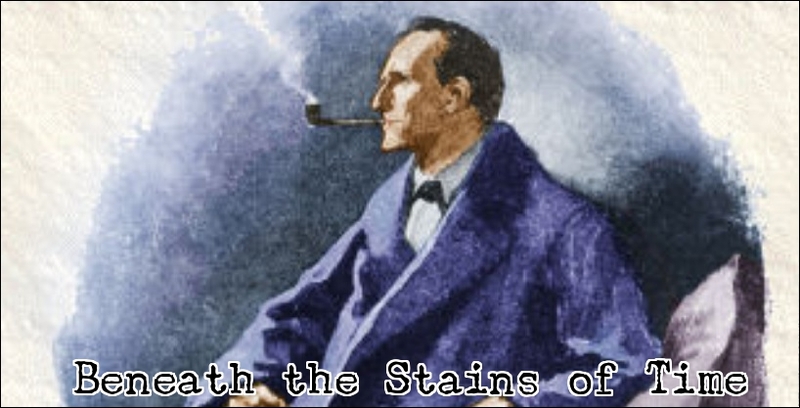 The strength of that story lay in the back-story of the victim and the motive of the murderer, which made it a wonderfully dark detective story. "are you considering doing a best of list of anime locked room mysteries? or just detective conan?" A list of best anime/manga locked room mysteries is probably something Ho-Ling should do. He's far more knowledgeable than I am when it comes to that corner of the genre and has access to more material. "i have seen "Subete ga F ni Naru: The Perfect Insider" and it has a good locked room too and i am curious to see your reaction when you witness the solution. it was also adapted in a j-drama series which summarized the whole anime in one episode. you can find english subs online." I'll keep that one in mind, but I finally want to get around to Hyouka, which has a couple of impossible crime episodes. Finally got around to my blog reading backlog! You already told me you loved the episode, so few surprises here of course ;P You might want to check out some other episodes by the same screenplay writer. I already discussed the excellent three-parter 603-605. The two-parter 91-92 was okay-ish. And while not by the same writer, you might also want to check out episodes 203-204, which features a return of the Cursed Masks most popular original characters! I was already planning to watch the three-parter sometime later this month, but thanks for the recommendation of the other two episodes. I'll guess will be seeing more of the Detective Conan anime on this blog in the near future.